Win-IN: Should there be a vote on the final deal? Help us ask the public in Winchester! Should there be a vote on the final deal? Help us ask the public in Winchester! Our next stall in Winchester will be on Saturday 21 April and hopefully this time the weather gods will be in a more favourable mood! Please see the info on Facebook and be there if you can! 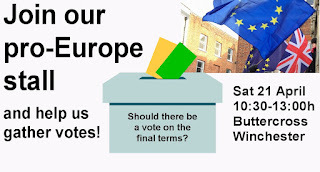 Pro-EU stall: come and vote on the final deal! Upcoming Action Day - this Sunday!